Bollywood actor Salman Khan’s association with Indian two-wheeler manufacturer Suzuki is well known, the superstar is now a proud owner of a special edition GSX-R 1000Z. 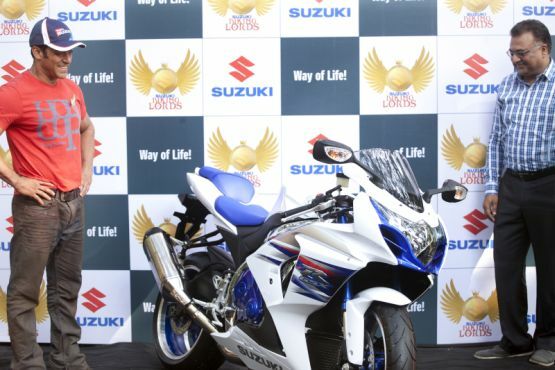 The blue and white Gixxer was presented to Salman on the occasion of the launch of ‘Suzuki Biking Lords’ – an exclusive superbike club by Suzuki Motorcycle India Limited (SMIL). Speaking at the event Mr. Atul Gupta, VP, Suzuki Motorcycle India ltd, told media personnel that Salman and the GSX-R 1000Z complement each other perfectly. These are two superstars that go well with each other. The GSX-R 1000Z is quite incomparable and this particular handcrafted production combines Suzuki’s technological prowess with the beauty of a handcrafted product. As of now, there is just one such machine in the country and I am sure Salman will have many memorable rides. Being a Suzuki Biking Lord and an ardent biker, he is someone who truly understands its worth. The collector’s exclusive GSX-R 1000Z is one of only a few made by Suzuki. The latest addition to his collection makes him the sole owner of the limited edition GSX-R 1000Z in the country. Salman also owns the legendary superbike, the GSX1300R Hayabusa, and the incomparable Intruder M1800R cruiser. With the latest addition to his stable, Salman reaffirms his commitment to the ‘Suzuki Biking Lords’ community.